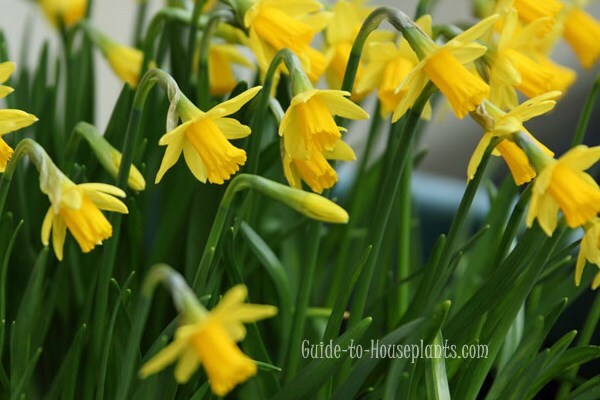 Growing daffodils indoors will bring a bright bouquet of spring-fresh flowers to your home in the middle of winter. Naturally spring-bloomers, daffodils are easy to force into bloom early. Making a plant bloom at a time other than its natural bloom time is called "forcing." Start forcing daffodils sometime in October or November for mid-winter to early-spring flowers. Gorgeous daffodils brighten up a sunny window long before spring arrives. You have beautiful daffodil varieties to choose from -- in shades of yellow, cream, orange, pink or white. The trumpet, also called a cup, may be a color contrasting to the ring of petals. Sizes vary quite a bit, from pint-sized minis to tall plants with giant flowers. As if daffodils aren't showy enough, some of them flaunt double petals, frilly trumpets -- even 2 colors per bloom. Choose bulbs for forcing. Some common varieties that are good for forcing are listed below. Some large flower heads get pretty heavy and will need to be staked. Miniature varieties are ideal for growing indoors. Don't dismiss miniature daffodils -- they're charming planted close together in a pot. Because daffodil varieties tend to bloom at different times, it's best not to mix them. They tend to look best, anyway, in a mass planting of 1 variety per pot. It's a good idea to order daffodil bulbs early to ensure their availability. Try to have them shipped no earlier than mid-September. 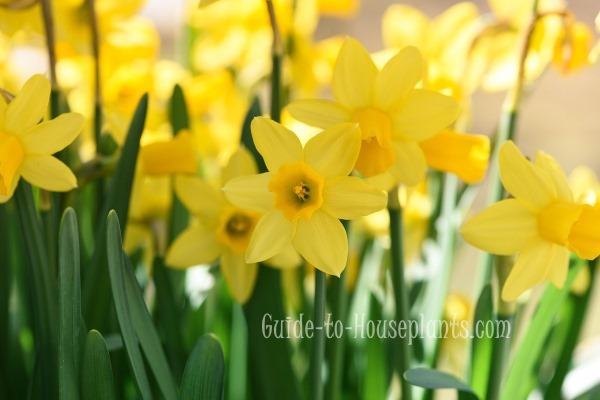 Buy the best-quality daffodil bulbs you can find from a reputable company. Bulbs should be firm, without soft spots or scars. Bulbs with 2 "noses", or tips, will produce 2 stems. For sure success, buy varieties that are labeled "good for forcing." You'll find this noted in bulb catalogs. Mini daffs are charming planted in a pot. Don't be afraid to crowd them for the best display. There are several cultivars available that are especially dependable for forcing. Daffodils with bright yellow blooms include 'Dutch Master' ...'Soleil d'Or'...and 'Unsurpassable'. 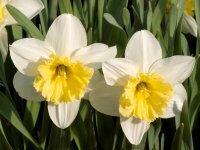 Bi-color daffodils include 'Barrett Browning', a long-time favorite with snowy white petals and an orange-red trumpet. 'Fortune' has soft-yellow petals with a trumpet edged in dark orange. 'Ice Follies' is white with a creamy yellow trumpet. 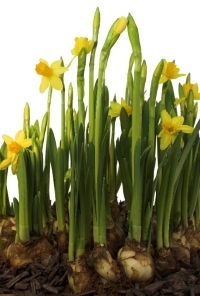 Miniature daffodils only reach about 6 in (15 cm) tall and include 'Little Gem', 'February Gold' and 'Tete-a-Tete'. Double-bloom varieties include buttery-yellow 'Bridal Crown' and pink-and-white 'Repleat'. The only difficult thing about growing daffodils may be choosing a variety. Choose a wide pot about 6 in (15 cm) deep with drainage holes in the bottom. Fill the pot loosely with potting mix. Set bulbs side by side -- close but not touching -- pointed end up, so that their tips are even with the pot rim. Do not press the bulbs into the mix. It should be loose to allow the roots to grow through it easily. Cover with additional potting mix, just so their noses are barely covered. Daffodils need a cold treatment for 8-10 weeks. If you bought pre-chilled bulbs, you can skip this step. Move pot to a dark, cool, but not freezing (40-45°F/4-7°C) location such as a basement, unheated garage or refrigerator. Avoid storing bulbs near ripening fruit or vegetables because they give off ethylene gas which can damage the bulbs. Keep them in cold storage for about 8-10 weeks. Keep the medium barely moist. 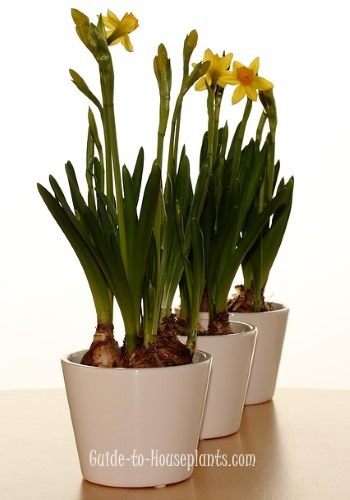 When shoots reach about 2 in (5 cm) tall, bring the pot out of cold storage and place the growing daffodils in a slightly warmer (50°F/10°C) location with low light. Over the next few days, gradually move it toward a sunny window. (By moving it in small steps while it's growing, daffodils will last longer.) Turn the pot every day for even growth. When in full bloom, keep potted daffodils in a bright location out of direct sun. Make your daffodils last longer by keeping the pot in a cool room. Flowers will last about a month if kept at a maximum of 60°F/16°C. Height: Up to 18 in (46 cm); miniature varieties reach 6 in (15 cm). Light: Bright indirect light. Rotate the pot once in a while because growing daffodils will tend to lean toward the light source. Water: Keep soil lightly moist. Growing daffodils are thirsty, so it's a good idea to check the soil often. Humidity: Average indoor (around 40% relative humidity). Fertilizer: Feed every 2 weeks with a balanced liquid fertilizer diluted by half. 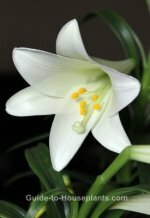 Propagation: Daffodil bulbs cannot be forced a second time indoors. You can transplant the bulbs outdoors, but it may take 2-3 years before they'll bloom again. If you want to keep them, allow the foliage to die back naturally, storing daffodil bulbs in a cool, dry place. Then plant the bulbs in your garden in the fall.